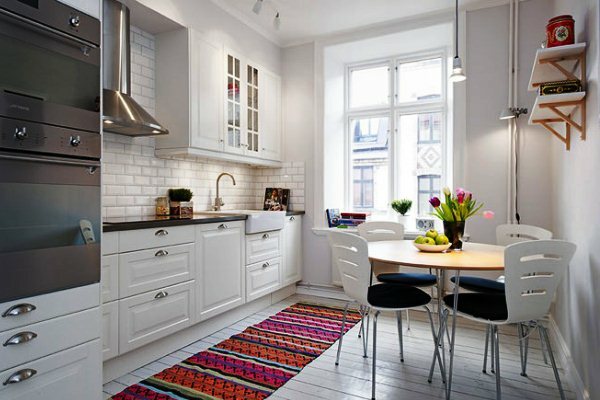 Many are faced with the problem of a small kitchen, and it may arise from those who live in an old house, where all the rooms of the apartment cannot boast of large size, or those who recently bought a completely new apartment. Very often, architects who design houses give a very small space to such an important part of the house. Kitchens to buy With such a problem there are not only our compatriots. In many countries of Europe, America, and, especially in Japan, the kitchen is very small, so the selection of furniture becomes a very difficult task. 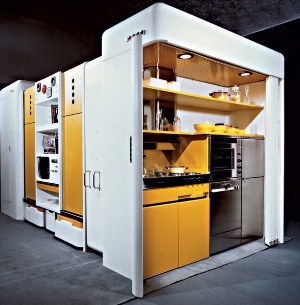 It is very difficult to equip the kitchen, make it functional, practical and stylish. Bearing in mind all the above problems and the need for a functional kitchen, many furniture manufacturers have taken upon themselves the mission of creating a small, but as practical as possible and stylish kitchen. 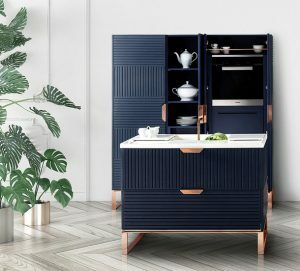 Best of all, the Italian studio Ruadelpapavero, which, working in tandem with its fellow countrymen, TM Italia factory, has developed a true innovation that will help solve the problem of a small kitchen room – the freestanding kitchen Miuccia. This development received a lot of positive feedback and already in the first days after the presentation, the manufacturing company received a lot of orders for such wonderful furniture. The manufacturer managed to combine compactness and functionality, which became the main feature of the furniture. 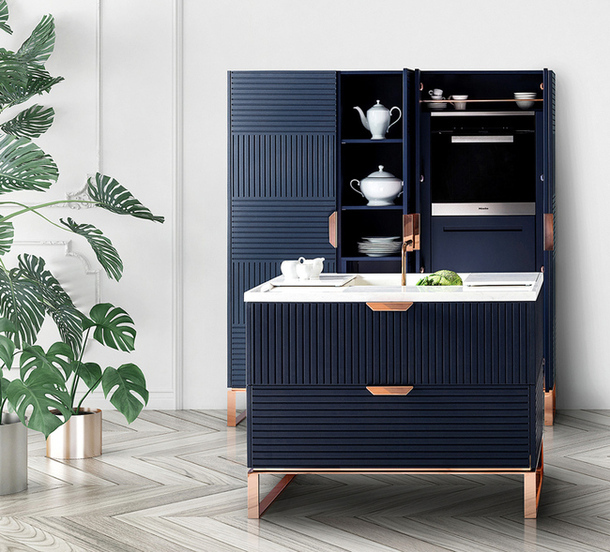 The exteriors of the kitchen are not left without finesse: the facades have a rich dark blue color, which is complemented by horizontal and vertical grooves, and the addition of the whole image of steel are metal handles and legs made from pink copper. The focus of the project is the kitchen island itself. Stone sliding countertops hide sink and stove. The island is equally useful both in the open and closed state. Opening the countertop, we get access to the sink of the hob, and in the closed state – this is a finishing work surface. This kitchen has come to taste for many owners of small apartments, as well as for those who often move, as the compact size allows you to take Miucña with you always.